Sometimes a little damage can do a lot of good—at least in the case of iron-based high-temperature superconductors. Bombarding these materials with high-energy heavy ions introduces nanometer-scale damage tracks that can enhance the materials' ability to carry high current with no energy loss—and without lowering the critical operating temperature. Such high-current, high-temperature superconductors could one day find application in zero-energy-loss power transmission lines or energy-generating turbines. But before that can happen, scientists would like to understand quantitatively and in detail how the damage helps—and use that knowledge to strategically engineer superconductors with the best characteristics for a given application. In a paper published May 22, 2015, in Science Advances, researchers from the U.S. Department of Energy's (DOE) Brookhaven and Argonne national laboratories describe atomic-level "flyovers" of the pockmarked landscape of an iron-based superconductor after bombardment with heavy ion radiation. The surface-scanning images show how certain types of damage can pin potentially disruptive magnetic vortices in place, preventing them from interfering with superconductivity. The work is a product of the Center for Emergent Superconductivity, a DOE Energy Frontier Research Center established at Brookhaven in partnership with Argonne and the University of Illinois to foster collaboration and maximize the impact of this research. "This study opens a new way forward for designing and understanding high-current, high-performing superconductors," said study co-author J.C. Séamus Davis, a physicist at Brookhaven Lab and Cornell University. "We demonstrated a procedure whereby you can irradiate a sample with heavy ions, visualize what the ions do to the crystal at the atomic scale, and simultaneously see what happens to the superconductivity in precisely the same field of view." Argonne physicist Wai-Kwong Kwok led the effort on heavy ion bombardment. "Heavy ions such as gold can create nearly continuous or discontinuous column shaped damage tracks penetrating through the crystal. As the very high-energy ions traverse the material, they melt the crystal at the atomic scale and destroy the crystal structure over a diameter of a few nanometers. 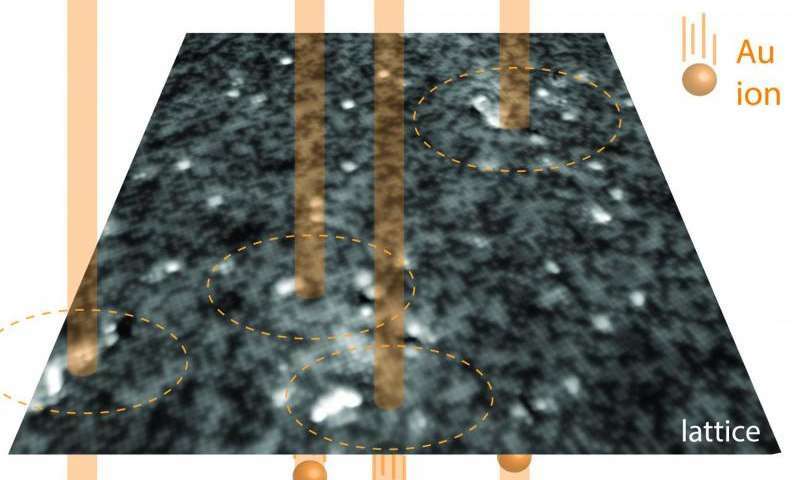 It's important to understand the details of how these atomic-scale defects affect local electronic properties and the macroscopic current carrying capacity of the bulk material," he said. The scientists were particularly interested in how the nanoscale defects interact with microscopic magnetic vortices that form when iron-based superconductors are placed in a strong magnetic field—the type that would be present in turbines and other energy applications. "These quantum vortices are like eddies in a river moving across or counter to the direction of flow," Davis said. "They are the enemy of superconductivity. You can't prevent them from forming, but scientists as long ago as the 1970s found you can sometimes prevent them from moving around by shooting some high-energy ions into the material to form atomic-scale damage tracks that trap the vortices." But random bombardment is, literally, hit-or-miss. Scientists developing materials for energy applications would like to take a more strategic approach by developing a quantitative and predictive theory for how to engineer these materials. "If a company comes to us and says we are developing these superconductors and we want them to have this current at a certain temperature in this type of magnetic field, we'd like to be able to tell them exactly what type of defects to introduce," Kwok said. To do that they needed a way to map out the defects, map out the superconductivity, and map out the locations of the vortices—and a quantitative theoretical model that describes how those variables relate to one another and the material's bulk superconductivity. A precision spectroscopic-imaging scanning tunneling microscope (SI-STM) developed by Davis is the first tool that can map out those three characteristics on the same material. Under Davis' guidance, Brookhaven Lab postdoctoral fellow Freek Massee (now at University Paris-Sud in France) and Cornell University graduate student Peter Sprau—the two lead co-authors on the paper—used the instrument's fine electron-tunneling tip to scan over the material's surface, imaging the atomic structure of the landscape below and the properties of its electrons, atom by atom. The precision allows the scientists to scan the same atoms repeatedly under different external conditions—such as changes in temperature and ramped up magnetic fields—to study the formation, movement, and effects of quantum vortices. Their atomic-scale imaging studies reveal that vortex pinning—the ability to keep those disruptive eddies in place—depends on the shape of the high-energy ion damage tracks (specifically whether they are point-like or elongated), and also on a form of "collateral damage" discovered by the researchers far from the primary route traversed by each ion. Collaborating theorists at the University of Illinois are now using the experimental results to develop a descriptive framework the scientists can use to predict and test new approaches for materials design. "These studies will really help us solve at which temperature which type of defects will be best for carrying a particular current," Kwok said. "The ability to achieve critical current by design is one of the ultimate goals of the Center for Emergent Superconductivity."